Born April 26, 1785, John James Audubon was birthed in what is now Haiti on his father’s sugar plantation. His birth name was Jean-Jaques, named after his father Jean who was a French privateer, commonly known as pirates. His father had the rank of Lieutenant in the French navy and his mother was a 27-year-old chambermaid from Les Touches, Brittany. His mother’s name was Jeanne Rabines and lived as a mistress with his father, Jean. She got a tropical disease and died on the island when her son was just a few months old. Audubon grew up in France, but when he was 18 his father got him a false passport to escape the Napoleonic wars and the family moved to America. After the death of his mistress, his father had a number of children of mixed race with several native women. In 1789 his father sold part of his plantation in Saint-Domingue and purchased a 284-acre farm called Mill Grove, 20 miles from Philadelphia. African slaves greatly outnumbered the French colonists, so friends convinced Jean Audubon to return to France. The children were raised in Couëron, near Nantes, France, by Audubon and his French wife Anne Moynet Audubon, whom he had married years before his time in Saint-Domingue. In 1794 they formally adopted both his natural children to regularize their legal status in France. They renamed the boy Jean-Jacques Fougère Audubon and the girl Rose. In France during the chaotic years of the French Revolution, Audubon grew up to be a handsome, gregarious man who played flute and violin, and learned to ride, fence and dance. Audubon loved to walk and was a great walker. He loved roaming in the woods. He often returned home with birds’ eggs and nests and made crude drawings. His father wanted his son to follow in his footsteps and tried to make a seaman of his son. When he was twelve, Audubon went to military school and became a cabin boy, but he found out that he was prone to seasickness and not fond of mathematics or navigation. After failing the officer’s qualification test, Audubon ended his fledgling naval career. He was cheerfully back on solid ground and exploring the fields again, focusing on birds. He found some Phoebes nesting in a cave. As he had read that they returned to the same spot to nest every year, he wanted to test that idea. He sat in the cave with them and read a book for many days, until they were used to him and let him approach. Then he tied string to their legs to identify them. The next year, he discovered that the same birds were back in the cave. It is the first known incident of banding birds. Audubon fell in love with a woman named Lucy Bakewell. Her father objected to Audubon’s lack of career goals and insisted that he find a solid trade before marriage, so he opened a general store in Kentucky on the Ohio River. After that, John and Lucy were married. During a visit to Philadelphia in 1812 following Congress’ declaration of war against Great Britain, Audubon became an American citizen and had to give up his French citizenship. After his return to Kentucky, he found that rats had eaten his entire collection of more than 200 drawings. After weeks of depression, he finally took to the field again. He was determined to re-do his drawings to an even higher standard. Audubon was working in Missouri when the New Madrid earthquake struck in 1811. When Audubon reached his house, he was relieved to find no major damage, but the area was shaken by aftershocks for months.The quake is estimated to have been ranked from 8.4 to 8.8 on today’s Richter Scale of severity,. It was slightly stronger than the San Francisco earthquake of 1906. The War of 1812 upset Audubon’s plans. He formed a partnership with Lucy’s brother and built up their trade in Henderson, Kentucky. Between 1812 and the Panic of 1819, times were good. Audubon bought land and slaves, founded a flour mill, and enjoyed his growing family. After 1819, Audubon went bankrupt and was thrown into jail for debt. The little money he made was earned by drawing portraits, particularly death-bed sketches that were greatly in demand by country folk before photography. Audubon was a terrible business owner, and eventually he realized that his best chance for success lay in his birds after all. Lucy became the main breadwinner by teaching children in their home, while her husband traveled all over the continent collecting specimens for his masterpiece, Birds of America (1838). 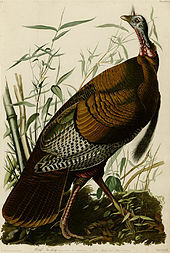 The book was two feet wide and three feet tall, with 435 life-sized hand-colored plates of birds. It was very expensive to print such a book, so the book was financed by advance orders as well as commissioned paintings, exhibitions, and any furs that Audubon was able to trap and sell on his excursions.